Our range of products include touch screen spray dryer model spd-p-111, pilot spray dryer, spray dryer digital model spd-d-111 and spray dryer microcontrollar model spd-m-111. Backed by a team of skilled professionals we are offering our clients a wide range of Touch Screen Spray Dryer that has 7” touch screen display & audio-visual alarm panel. The provided spray dryer is carefully manufactured by our skillful workforce using well tested components and progressive technology keeping in mind the set norms of industry. Also, this spray dryer undergoes several tests by our quality auditors in order to deliver a defect free range. PC Software through RS-485 two way communication for Inlet & Outlet Temperature, Databank for Various solvents, Online graphical representation for Inlet & Outlet Temperature. Backed by a team of skilled professionals we are able to provide our clients a wide range of PilotSpray Dryer ranging from 2Kg/Hr to 15Kg/hr. Our provided Pilot Spray Dryer is tested on several parameters so as to make certain its defect free range. 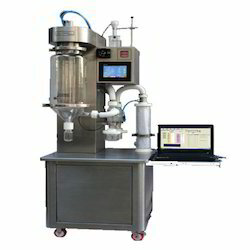 This Pilot Spray Dryer is precisely developed by using premium quality components and sophisticated technology in adherence with the set standards of industry. 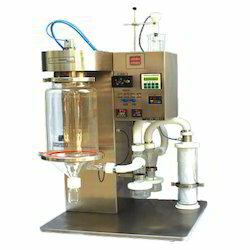 Customers can avail this Pilot Spray Dryer from us at competitive price.